In the newest chapter of our Modern Rolex, Future Classics series, we are turning our attention to the now discontinued Rolex Sea-Dweller 116600. Often referred to as the “last classic Sea-Dweller” there are several factors that almost guarantee (nothing is 100% guaranteed, of course, in vintage Rolex collecting) that the Sea-Dweller ref. 116600 will be a future collectible. Let’s find out why. Rolex released the Sea-Dweller ref. 116600 in 2014. With its introduction, Rolex brought back the Sea-Dweller watch after replacing the model in 2009 with the larger Deepsea model. The Rolex Sea-Dweller 4000 ref. 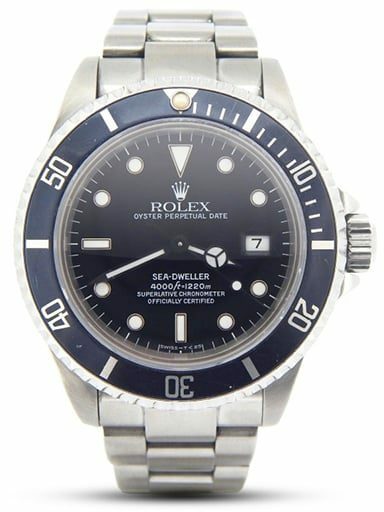 116600 includes a 40 mm Oyster case in stainless steel, which is the same size as the Submariner. Yet, the SD wears bigger thanks to its approximately 15 mm thick case and thick domed sapphire crystal. The width of the case accommodates the helium escape valve and ensures the watch’s 4,000 feet (1220 m) water resistance. As a modern Rolex dive watch, the Sea-Dweller 116600 comes equipped with a unidirectional rotating bezel in Cerachrom ceramic. The bezel includes graduations for all 60 minutes, mixing numerals and hash marks. The black dial of the Rolex SD 116600 houses luminescent-filled hour markers, luminous Mercedes-style hands, and a date window at 3 o’clock. However, note the lack of Cyclops lens on the sapphire crystal above the date. Powering the functions of the Sea-Dweller is the in-house Rolex Caliber 3135 with a 48-hour power reserve. The stainless steel Oyster bracelet does not just have one extension system, but in fact, two of them. First, there is the Glidelock extension, permitting the wearer to extend or shorten the bracelet in 2 mm increments up to 20mm. Then there is the Fliplock extension link, which extends the bracelet by 26 mm. All in, the Sea-Dweller 4000 can be worn over a 7 mm wet suit. Why Will The Modern Rolex Sea-Dweller Be A Future Classic? So, why do we think that this particular Rolex Sea-Dweller will be a future collectible? There are several reasons, starting with its short manufacturing run. The Sea-Dweller 4000 ref. 116600 was only in production from 2014 until 2017— that is just three years making this model one of the shortest produced Rolex watches in the brand’s modern history. 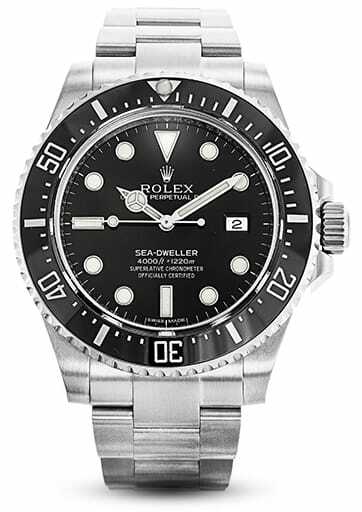 Next, this is the first Sea-Dweller to include the Cerachrom bezel; the preceding model, the Sea-Dweller ref. 16600 had an aluminum bezel insert. However, it is not so much the “firsts” that this Sea-Dweller brings to the table but in reality, the “lasts” that makes it a future classic. The 116600 is the last Sea-Dweller to measure 40 mm and the last Sea-Dweller to omit a Cyclops on the sapphire crystal. When Rolex replaced the Sea-Dweller ref. 116600 with the ref. 216600 in 2017, the watch grew to 43 mm and it now includes the protruding magnification lens above the date window. Many are not happy about these changes in design, but it does bode well for the future of the “last classic Rolex Sea-Dweller.” Indeed, the demand of the Sea-Dweller ref. 116600 has steadily increased since the debut of the newer Sea-Dweller ref. 216600. To summarize, the Sea-Dweller ref. 116600 essentially bridges the gap between old-school SD watches (with its case size and smooth crystal) and modern SD watches (with its Cerachrom ceramic bezel and improved Oyster bracelet). And that, coupled with its three-year run, paves the way for the Sea-Dweller 116600 to become a sought-after Rolex collectible in a few decades time.